Christians have a strong belief in the afterlife. It is their belief that when a loved one dies, the burial service will focus on their loved one achieving eternal peace in Heaven. Another purpose of the burial service is to help give strength to those grieving so they can cope with their loss. Before the burial, the deceased person's body is washed. It is believed that one must be clean before entering the Kingdom of Heaven. After cleansing, the body is dressed (usually in the person's best clothing). The body is then placed in a casket where it is displayed on a covered stand known as a catafalque. The person's hands are crossed on top of the chest as they were when they would have received Communion. If desired, a prayer book or rosary may be placed in his or her hands. In modern North American society, these preparations are performed by the funeral director. In the past, the family members performed these duties, and the body was laid out at home before burial. The wake is the modern version of the ancient practice of sitting with the dead. Friends and family members are received at the funeral home to share in the family's grief. Flowers and photographs of the deceased may be displayed at the funeral home during the wake. The casket is displayed and may be opened or closed, depending on the circumstances of their death and the family's preference. The purpose of displaying the body is to allow the mourners to acknowledge the reality of their loved one's death. In some Christian denominations, the custom is to have a prayer service at the wake. Scriptures and prayers with a comforting theme are read during the service. A eulogy may be given at this time as well. If the funeral service is to be held in a church, the priest or minister enters first. The casket is carried by pallbearers and the family members follow. When the service is concluded, the same protocols are followed when leaving the church. Prayers are read and hymns are sung throughout the service. They are specifically chosen for their sense of hope and comfort. Christians acknowledge their loss but look forward to being reunited with their loved ones at a later time. The priest or minister will give a sermon or homily. It will remind those assembled for the funeral of the Christian perspective about death; that those who have passed on in faith will have eternal life with God. By his own resurrection, Jesus conquered death for all Christians. Passages from the Bible will be read. A passage from the Old Testament, the New Testament, and the Gospels will be selected for inclusion in the service. Holy Communion will be included in the funeral service. Once the service has concluded, family members and friends will leave the church and go to the gravesite. The cemetery may be next to the church or the casket may need to be transported to another location by hearse. Christian burials also include a brief service at the gravesite. Prayers are spoken by the priest or minister as the body is committed to the grave. Friends and family members say their final goodbyes. This may include placing flowers on the casket. A small amount of dirt may be placed on the casket as well. Following the funeral service, it is a tradition for the family to host a reception for those who attended the funeral. Food and drink are provided. This is an opportunity for the immediate family to receive emotional support in their time of grief. When attending a funeral, it is best to wear attire that is conservative and respectful. Black or another dark color is always your best option. You should always avoid wearing bright, flashy or glittery clothing to a funeral. A good rule of thumb is, dress to blend in. It is not mandatory to give flowers (or a plant) but it is a nice way to express your love for the person who passed. Condolence flowers can also bring comfort and love to the grieving family members. Flowers, in general, traditionally represent growth, new life and movement forward. The various flowers that are appropriate to include in a condolence arrangement are carnations, chrysanthemums, lilies, and roses. Should I Give a Gift? It not necessary to give a sympathy gift but it is acceptable and usually appreciated. You can give a traditional card, flower, plant or food but there are other unique gift options you may want to consider such as a restaurant gift certificate, memorial stepping stone, photo album, memorial jewelry or a charitable donation in their loved one's honor. You can also offer up a gift of service to help them with daily chores or routines such as doing their grocery shopping or their laundry. It is also acceptable to give money as a gift. But if you choose to give money, be as discreet as possible. This is not meant to embarrass but to help in their time of need. 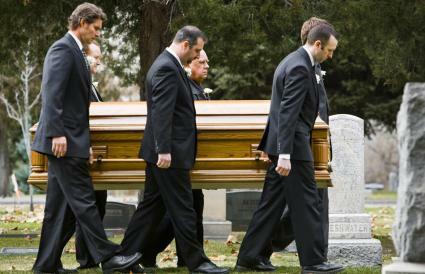 The burial service is all about honoring and paying respect to your loved one that passed. The burial service itself should reflect on your loved one's life, it should offer up a prayer that your loved one gets into Heaven and it should give strength and comfort to those who are grieving and help them cope with their loss.